Heat oven to 350°F. In large bowl, toss chicken and 1/2 cup of the wing sauce to coat. Spray two large (14-inch) pizza pans with cooking spray. Arrange half of the tortilla chips on one pizza pan; top with 2 cups of the chicken and 1 1/2 cups of the mozzarella cheese. Repeat on second pizza pan. Bake 8 to 10 minutes or until cheese is melted. Top each pan with celery and blue cheese; drizzle with remaining 1/4 cup wing sauce. To serve; slide one pan of nachos off onto other pan to make one large mound of nachos. Serve immediately. These flavorful nachos can also be made on a large baking sheet- serve them right from the oven. Though nachos are a traditional Mexican snack, this nachos grande recipe takes the concept of nachos and reinvents it with the help of a classic American dish: Buffalo chicken wings. Doused in a hot sauce and served with blue cheese, ranch and celery sticks, Buffalo wings are a staple appetizer in many American households (especially during football season!). 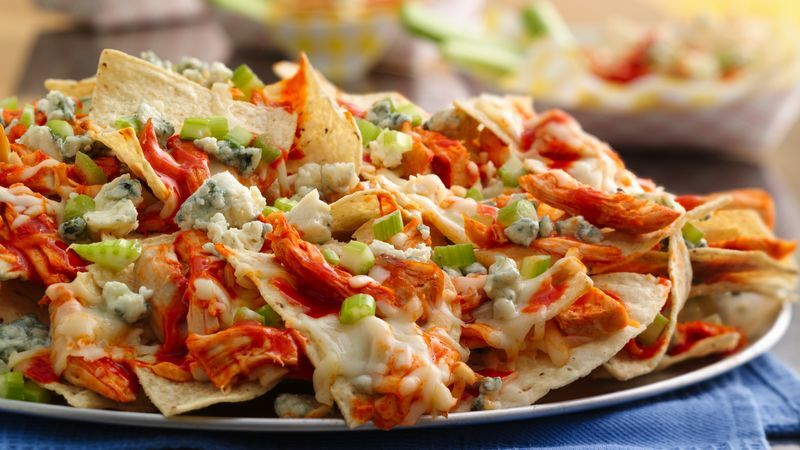 This buffalo chicken nachos recipe is the best of both recipes. Crunchy tortilla chips get piled on a giant platter with shredded rotisserie chicken, buffalo wing sauce, blue cheese and mozzarella cheese. The result is your new favorite appetizer! Those this recipe isn’t your typical nachos recipe, that’s part of the fun. Nachos can be customized to so many tastes, and we have a recipe for everyone. Want to dive into some more Mexican-inspired dishes? Learn how to make enchiladas next!